She came. I knew she would. I knew she wouldn’t be able to stay away. She stood in the doorway with eyes alive with anticipation. Smiling, she glided past me into the room where I had waiting for her. I had never seen her look more enticing than she did right then, a vision that surpassed all that came before. Her dress was simple; silk draped across her breasts like a lover’s hands, caressing them, drawing my eyes to them and the expanse of bare skin above. Below them the dress drifted down in smooth ripples, gently swirling around her legs as she moved. She was always exquisite in that shade of the deepest, lushest red. It was my favorite color on her, bringing to mind a rose or a full red wine. Her beauty surpassed that of even the most vivid of roses and her flavor was richer than any wine. I watched her, devoured the sight of her as she surveyed the room. I was pleased to see the look of awe and delight grace her delicate features. The dimly-lit room cast flickers of amber over her skin, giving it a warm golden glow. I needed to touch her and feel that warmth that emanated off her. I wanted nothing more than to hear her soft sigh as I quietly swept my hand from her shoulder down her arm before coming to rest gently over her hand. I took a step forward to brush her long waves to one side, baring her sweet, soft skin for my lips. I wanted to feel her tremble against me as I lingered there, whispering to her how bewitching she was. Indeed, she was a temptress, an enchantress made for seduction and pleasure. I had known from the very moment she stepped into my life. I was in the elevator heading up to the eleventh floor. I was still filled with that mixture of anxiety and excitement that comes with starting a new job. It was Friday, I had made it through the first week. I was ready to just relax on the weekend, maybe spend some time on the Lakefront trail. Spring was starting to give us glimpses of herself between the cold windy days of a Chicago winter. It was a time for new beginnings–not just for nature, but for myself as well. I was on the brink of a whole new life. The new job brought more money and more opportunities. Everything just felt like it was going my way. And when she stepped into the elevator next to me I knew God was smiling down upon me to have sent such a blessing my way. She was a vision in a sweater as pale pink as the tips of an apple blossom. Her dark eyes passed over me quickly. A cordial smile graced her lips before she turned to push the button for the fourteenth floor. That was the only exchange between us. She patiently watched the numbers flash one by one until they stopped on number eleven. The doors slid open and she stepped to the side to let me pass. The static shock as I brushed her arm when I slipped passed was a sign. I met her eyes for the first time then. The depth and honesty in them stunned me. Never had anything or anyone called to me the way she did. Each time I saw her, I felt the urge to just step up and introduce myself, to speak with her and see if she felt the same. I always held back, protecting myself from the fear that she would somehow see into the darkest corners of my soul. I tried to ignore it – to resist her pull. It was of no use, each time I saw her the hunger grew. Eventually there was no denying it. I had to have her as my own. She had become an obsession, one that began to affect every aspect of my life. My every thought–both waking and dreaming–were of her. I began to see her daily in places I had never before noticed her. She had a habit of appearing when all was quiet startling me as I was deep into my own thoughts. It was weeks before I engaged in small talk with her. At first it was nothing more than a comment about the weather or some quip about the day. Our daily pleasantries began to broaden past her stopping for a short chat with me in the halls or on the sidewalk before moving our separate ways. I ignored the odd looks of those around. I knew what they were thinking, how could someone as beautiful and perfect as her give someone like me the time of day. I could care less about what they thought. I only cared for her. Occasionally she would join me for lunch or share the walk home. It wasn’t long before she was in my kitchen discussing the finer points of Poe, Tolkien, Rand, or even King, sipping Merlot as she sat on the counter watching me prepare an evening meal. She was a free spirit who seemed to come and go on a whim. There were times when she would leave for days. No notice, no explanation just…gone. At first I would worry where she was, what she was doing, who she could be doing it with. The worry would disintegrate into rejection. I knew she could never want me as I wanted her. My heart would ache and my eyes would sting, but I couldn’t cry. The anger would surge before the tears could fall. How dare she just toy with me, string me along, make me believe that there could be something between us? It was pathetic how edgy and anxious I was when we were apart. Some days I felt as if I were barely human, nothing more than an animal existing on the edge of society snapping at those around me. An animal who had been kicked aside and left along the road. Then she would show up and be all sweet smiles and playful kisses, making light of my despair. She would pull out all her tricks to have me back in hand. I wanted the companionship, the affection and the attention that only she could give me. Usually all it took was a combination of those full lips tipped into a pout along with her doe eyes pleading her case and she was once again the center of my world. She had me all twisted up. Just a look on her face and my mood would change. One moment, I was flying high as if I were weightless watching the world drift below me. All the people living their everyday lives didn’t matter any more than ants matter to a hawk. They didn’t even exist as far as I was concerned; it was just her and me. The rest of the world be damned. Other times I was hollow, nothing more than an inanimate object, no feelings, no thoughts. I just was. Her words could slice right through me. Hitting my soul and twisting as if she were trying to burrow a place out for herself. I tried to tell her there was no need; she already inhabited the whole thing. Her mind games were colorful. At times she would be in her long flowing white skirt, so virtuous that I was torn between wanting to venerate her or corrupt her. These times she was lighthearted yet curious. She flitted about my apartment or as we walked the trail in the park. She wanted to learn everything and I wanted to teach it to her. In her youth and innocence she would flash me shy glances under her lashes and coy grins. If she caught me returning the look, the loveliest blush would appear. The vibrant days she was animated about everything. It didn’t matter if it was good or bad. Arms covered in violet and magenta would fly about as she recounted her day or reacted to mine. She would jump from topic to topic saying whatever came to mind. Her voice was louder, her stride wider, her smile bigger and her eyes livelier. She was bright and fast paced, a chaotic jazz band, each instrument chiming in with their own twist on the melody but all blending together for a composition that is unique and all the more awe-inspiring. Other days she would be in dark earthy colors, rusts, chocolates, or dark greens. Those colors complimented her glowing skin. Then again, the glow could have been a carryover from the devilish glint in her eye. She would be so serious and yet witty as we debated over everything from the best all-time movie to what shade the leaves were turning. Those were the days I looked forward to the most. She was spicy, sarcastic and intelligent. We could discuss anything and everything on those days. I was amazed at how we shared so many similar likes and dislikes, yet we were polar opposites. It was as if we were two sides of a coin. She always saw the good or the positive where I only saw the dark and cynical. Then there were the bad times. The blue hours and gray days where I would see her on the street, maybe out with her friends at lunch, or walking down a busy corridor. She would catch my eye and look away quickly as if she didn’t know me at all. I couldn’t approach her then. Her aura told me to stay the hell away. I would watch her from a distance on those days wondering why I wasn’t allowed into even the smallest part of her life when she had completely taken over mine. Those days were hard, but the hardest of all were the red days. When she was in red she was a goddess. La femme fatale, the Marquis’ Juliette in the flesh. The enhanced sway to her hips, the slight throatiness of her voice, even her scent altered in a way that she was more alluring. I often wondered if her mood was a reflection of her dress or her dress was a reflection of her mood. She could tease like no one else. Come-hither looks and comments rife with innuendo. And a tease she was. I could never get enough of her. I was always left wanting, yearning for what I knew would be an ecstasy like none other. She left me frustrated and aching more times than I cared to remember. But not tonight. No, tonight all of that was gone. I could see it in her eyes. Finally the reflection of my own desire was there. There were no demure glances, no devilish grins. Tonight even the very air was charged. Each word, each glance, all held the promise of what was to come. I poured our wine but barely touched mine. I was too captivated by the way her rose tinted lips curved against her glass as she sipped hers, yet leaving no scarlet traces behind as she twirled it restlessly between her fingers. We made meaningless small talk as we savored the tension between us. I felt as if I were on the steep incline of a roller coaster. Climbing higher and higher ever so slowly, my heart pounding and stomach knotting the whole way as I waited for the moment I would reach the top. Barely a second to catch my breath before the rush of descent. The meal I had so carefully planned, all her favorites, remained untouched. We sat separated by the small table covered in a dull cloth with a plain place setting. The whole scene would have been unremarkable if not for her presence. She alone gave the whole setting a quality of elegance never before seen in this dark isolated cell masquerading as my heart and home. There were lulls in the conversation as each of us struggled to find things to talk about. Timing was everything tonight, and there was an order which needed to be followed. The silences hung between us, as heavy and oppressive as a storm cloud hovering on the brink of letting go. Our eyes locked, saying more in those pauses then our words ever could. Her eyes spoke of the night ahead, foretelling of the fire to come. Eventually we gave up the pretense of eating and just finished off the last of our wine. She stood up and crooked her finger at me summoning me with a sultry smile as she stepped back. I followed her as I always had, perhaps with a more rapacious gait than normal, but following all the same. I grasped at her, desperately wanting to pull her in for a kiss. She eluded me, scampering away with a laugh. It wasn’t long before I caught up with her, yet she foiled me again. I was rebuffed playfully. Once the back of my knees hit the bed I sunk down onto it. Staying on the edge waiting to see what she would do next. Her eyes never moved from mine as she danced back. An unheard blues tune directing the rhythmic sway of her hips. The smooth silk of the dress darkened as it wrinkled under her hands inching it up slowly. I couldn’t look away and I couldn’t look her in the eye. I’d waited so long for this moment thinking it would never happen. Once it was I didn’t want to miss an inch of her. Slowly she revealed herself to me. Every hidden part now available to my eyes and my eyes alone. With the air of a fallen angel she stalked toward me. The blood coursed through me, pulsing with each step she took. My throat had grown dry inhibiting any words to pass, but no words were needed for the fantasy I was steeped in. It was nothing I had ever experienced. The night became a combination of heaven and hell. A sweet torture of unadulterated bliss momentarily overpowering the pain that was to come. Every sigh, every whispered breath brought us closer to Shakespeare’s little death. At that moment I saw the pure innocence of her soul. A shudder, a cry, an arch to her back, and then stillness, followed by a sublime tranquility broken with a kiss. All but one light had gone out. Instead of the warm glow of earlier there were just foreboding shadows creeping in around us. I heard them at the door, the sound of metal against metal rousing me from my dream. I knew I had to leave. There was never any doubt that this was the way the night would end. I hated it yet I knew this was the way it had to be. She wasn’t meant to be mine. Maybe in a past lifetime, definitely in the one to come, but never in this one. I got up from the bed as quietly as I could. I didn’t want to wake her. She was so peaceful lying there. An absolute angel with no idea of what the morning wouldn’t bring. Her beautifully expressive eyes would never again give me a glimpse of her soul. The maiden’s blush was gone from her cheeks. Her parted lips begged for one more kiss. A kiss I could never give. I left her like that. Just closed my eyes and turned away. I followed the men blindly. Not really noticing where we went or caring. I stood where they told me to stand and sat where they told me to sit. The whole time her name echoed through my mind. Ashlyn…always Ashlyn…Ashlyn never more. Ashlyn in white, all innocent and blushing. Ashlyn in cinnamon and cream, telling me the world was a wonderful, beautiful place. ..sentenced you to death for the murder of Ashlyn Lufian. Ashlyn in slate blue, looking away as if she didn’t want to know me. You have refused all options of appeal. There is no stay of execution. Ashlyn in red. Forever in red. I stayed silent, saving my words for her. She was waiting for me and it was time to begin again. I looked out, knowing there was a roomful of faces in front of me, but I didn’t see a single one. All I saw was Ashlyn, crooking her finger, beckoning me to follow her into the crimson flames. With all the social media that’s out there, I knew it would happen that I forgot about one of them: the blog. My apologies for neglecting you, Blog. It won’t happen again. But what better way to make it up to you, than to post about our most recent book, SLIGHTLY DENTED HALOS, by LA Jackson. This truthful tale of one woman’s account of elder care is both humorous and touching, and will leave you with great appreciation and respect of the people who take on the task of inviting aging family members into their home. Slightly Dented Halos is a creative nonfiction story about the author’s real-life experiences after inviting elderly in-laws to move into her home. From comical anecdotes of combining two disparate household styles to the heartbreaking depiction of the father-in-law as his life ends, the author provides a panoramic look into her life. The largest generation in history is entering the golden years, with adult children left to make decisions about the care of their elders. 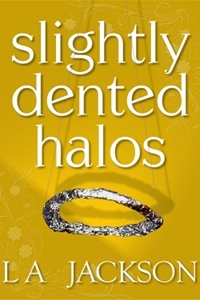 Slightly Dented Halos provides no instruction but rather a sense of togetherness and empathy for others facing the choices of nursing homes, elder care, hospice and end-of-life issues. LA Jackson’s writing style has often been compared to a conversation with a friend over a cup of coffee. Drawing from her own experiences raising a son, blending a family, caring for elderly relatives, maintaining a successful career outside the home and clinging to a sense of humor, Jackson explores the complexities of relationships, writing about the aspects of life that make her laugh or cry. 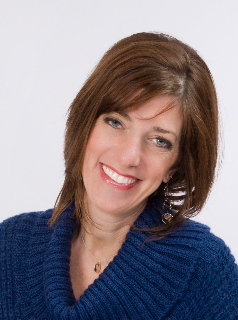 Jackson lives outside Chicago with her husband, three Dobermans and very few unexpected visitors.